Take a little more transit and eat a little less meat — two things you can do to reduce your impact on the environment. 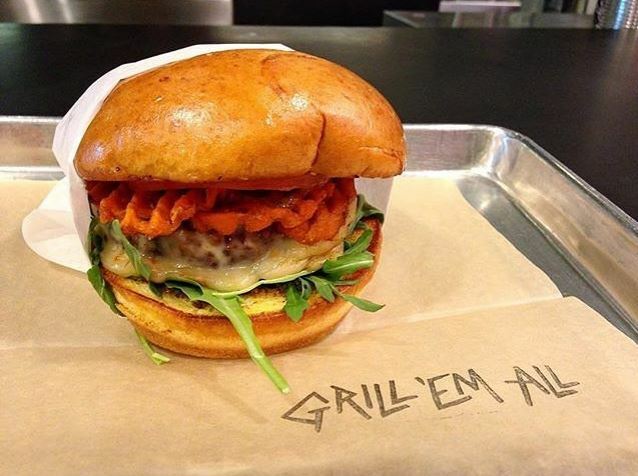 In this installment of Meatless Mondays with Metro, let’s take a trip to Grill ‘Em All in Alhambra. The most difficult issue with being vegan is being on the receiving end of a sudden craving for a cheeseburger. There’s nothing I enjoy more than a great burger with a crispy side of fries – however, vegan options are often less than tasty. Luckily, I stumbled upon Grill ‘Em All. Grill ‘Em All is inspired by and a tribute to everything heavy metal. You can find specialty burgers named after metal bands and lyrics – Metallica, Jump in the Fryer, Cowboy from Hell, Behemoth and more. Although some of the burgers contain bacon or cheese, all can be personalized with veggie patties and other vegan accommodations. If you’re like me, you might be a little nervous personalizing a “non-vegan” menu item. I always imagine the cook accidentally making a mistake to my order by adding an animal-based ingredient. So I played it safe and ordered the original vegan burger on the menu, Stick to Your Guns. The burger consists of a veggie patty topped with vegan cheddar, pico de gallo, guacamole and fried onions. My craving was beyond fulfilled! Another popular item on the menu are the Primate Fries. 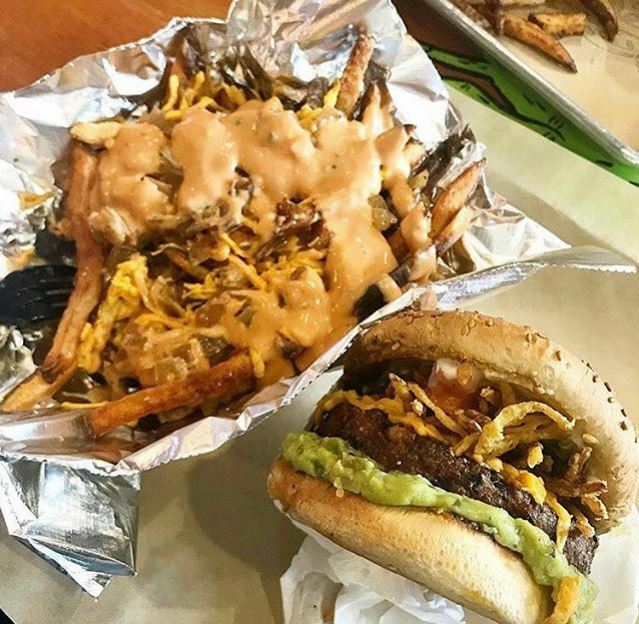 Similar to In-N-Out’s animal style fries, they contain thicker cut fries topped with cheddar cheese (vegan or non-vegan), vegan Thousand Island dressing and grilled onions. To get to Grill ‘Em All, take the Metro Bus 78/79/378 or 176 to the Main/Garfield stop. My Vegan in Pasadena has an “impossible burger” (new item) that one of the patron said was really good. Now you know how close they are to You! Right! Not everybody will be getting there via an Metro Bus. Some may take a local transit bus. Some may take a bike or walk. Addresses are important.